Sustrans has published a report into the state of the 16,500-mile National Cycle Network and laid out a long-term plan to make it safer and more accessible. Founded by Sustrans with help from a National Lottery grant awarded in 1995, the network has, in the words of the charity’s CEO Xavier Brice, ‘historic problems’. Over half (57%) of the UK population lives within a mile of the cycle network. 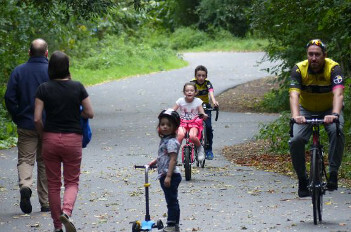 However, Sustrans argues major improvements for access and safety are needed to open it up to everyone, including children and wheelchair users. Only 54% of the network is currently suitable for a 12-year-old to use safely, a road safety benchmark set by the Government. While a third of the paths on the network are separated from motor traffic, on-road sections still account for 68% of routes and include nearly 2,000 miles of busy A and B roads, according to the Sustrans report. Launching the report, entitled Paths for Everyone, at the Houses of Parliament, Mr Brice described the network as a ‘well-loved, well-used asset’. Paths for Everyone sets out 15 recommendations for local authorities, landowners and national governments and agencies, including a proposal to remove or redesign 16,000 barriers on the network. ‘Many disabled cyclists use parts of the National Cycle Network, whether on bikes, tandems, hand-bikes or trikes,’ said Isabelle Clement, director for the charity Wheels for Wellbeing. The report also recommends doubling the number of paths away from cars, from 5,000 to 10,000 miles and diverting all routes off busy and fast moving roads onto new quiet-way roads. Adopting a new quality design standard for paths, including width and surface so all routes are classed as ‘very good’ or ‘good’ by 2040 was also put forward in the report. Sustrans estimates that the overhaul will double the number of people travelling on foot, by bike or in a wheelchair up to 8.8 million. These trips will generate £7.6bn in economic and local benefits every year, as a result of reduced road congestion and health benefits from increased exercise. ‘Politicians across the UK are grappling with problems like congested roads, air pollution and increasing levels of obesity,’ said Mr Brice. ‘Trips on the network benefit the UK economy by £88m through reduced road congestion and contribute £2.5bn to local economies through leisure and tourism,’ he continued.